The fandon has raised a decent amount of money so far for Jenn's medical bills and the caring keeps coming as fans today are hosting a 12 hour gaming charity stream to earn even more! The event starts in about a half hour so make sure to pop in and give if you can! Hello everyone! This is Gregdawg of Hoof Hearted, here with an important announcement. 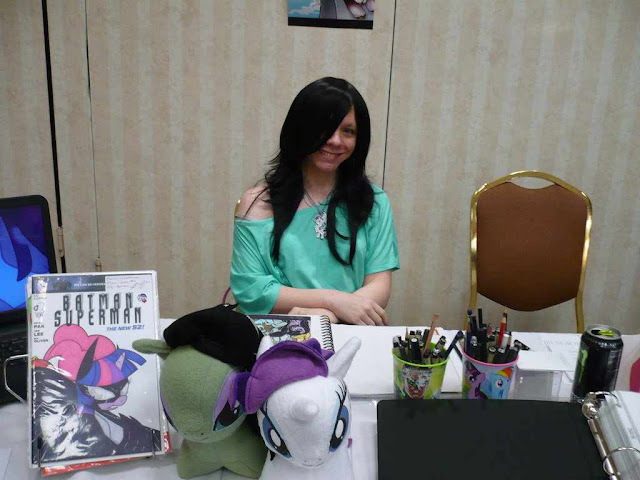 My group, Hoof Hearted, has had the pleasure of interacting with Jenn Blake, an artist on IDW’s My Little Pony comic series, at several conventions over the last two years. Unfortunately, as you may already be aware, it was recently announced that Jenn has been diagnosed with brain cancer, and to make matters even worse, she doesn’t have the money needed to pay for her treatment. Since that announcement, the My Little Pony fandom has come out in force to support her as she battles against this horrible disease. Now, we’d like to do our part to help out as well. Starting at Noon, Pacific Standard Time on Saturday, November 12th, we will be hosting a twelve-hour gaming charity stream to raise funds for Jenn Blake’s brain cancer treatment. The first half of this stream will focus on individual members of Hoof Hearted playing games of their choosing, while the latter half will be devoted to multiplayer games such as Jackbox, Cards Against Humanity, and Tabletop Simulator. The second segment will not only involve all members of the Hoof Hearted crew, but also some friends of our group, and possibly even you! As with most charity streams, there will be donation incentives, one of which will be the opportunity to participate in the stream itself. The rest of the incentives will be announced by the time the stream starts, and we think you guys will really enjoy them. Once again, this stream will begin at Noon Pacific time on Saturday, November 12th, and will be hosted at Twitch.tv/HoofHeartedYT. I look forward to seeing you there so that we can all help Jenn beat brain cancer! Halloween Tee Contest Results and Winners!